REUTERS/Francois LenoirGermany’s Chancellor Angela Merkel gestures as Britain’s Prime Minister David Cameron and Portugal’s Prime Minister Pedro Passos Coelho talk during the European Union leaders summit in Brussels July 16, 2014. 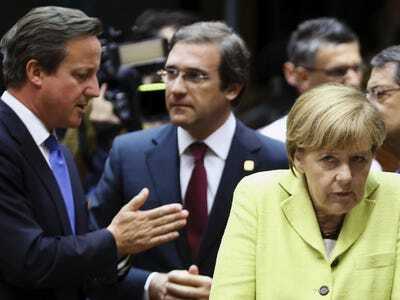 German chancellor Angela Merkel has reportedly warned British prime minister David Cameron that she would end her support for Britain staying in the European Union if Cameron attempted to restrict immigration within Europe. In question is Cameron’s proposal to put a cap on low-skilled migrants from the rest of the EU, which comes largely under pressure from the anti-European UK Independence Party (UKIP). The immigration restriction violates the basic principle that allows members of the EU to live and work in an EU state, Merkel has reportedly argued. The Guardian quotes senior Tory MP Ken Clarke as saying on the BBC’s Sunday Politics: “Not only is that one of the principles of the EU, it’s the basis of any serious single market. The Norwegians, who eurosceptics admire, they accept the free movement of labour. They have got a bigger proportion of other EU nationals in their country compared with their own nationals than we have.